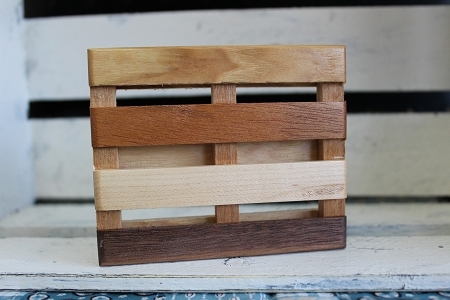 The Multi Wood Pallet Soap Dish has four top stringer boards and three boards across the bottom, making this a spitting image of a miniature wooden pallet. 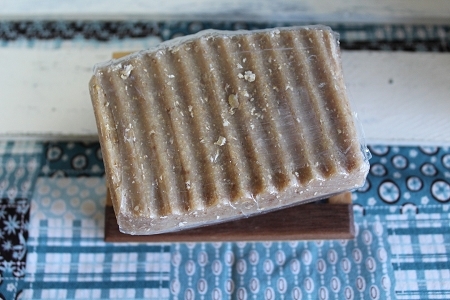 Treat yourself to this fun and unique item or give it along with a bar of soap as a housewarming gift. 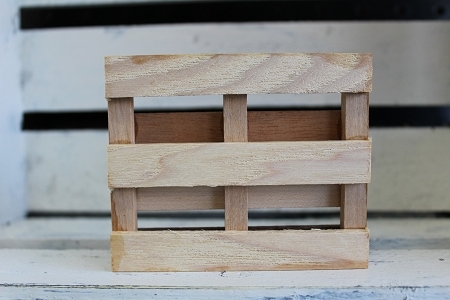 Each dish is unique and one of a kind as these dishes are made from a wide variety of reclaimed hardwoods, such as cherry, eastern white maple, red oak, white oak, hickory, ash, dark walnut, cherry, beech, etc..
Each one is completely unique and different and no two are alike. You will likely get a soap dish different than pictured. These soap dishes measure 3 inches by 3.75 inches by approx. .75 inches thick... plenty large enough for any size bar of soap. Each dish has been meticulously hand sanded on all surfaces, edges, and corners. All edges and corners have been rounded over, making them soft and elegant to the touch, yet tough and rugged looking at the same time. Each soap dish has been finished with a semi-gloss clear coat finish. A soap dish significantly extends the life of a bar of soap - but did you know you can also extend the life of your soap dish? Use your soap dish in pairs to extend the life of the dish - use one for 2-3 weeks, then switch it out with the second dish. By allowing the first soap dish to completely dry out you will prevent mold and mildew from developing and growing on your dish and greatly extend the life of your soap dish.